Flash is primarily an animation tool that has become increasingly popular over the last decade. We like it for it's creative potential and because we're fascinated by animation. Although, websites designed and developed entirely in Flash have some limitations (you need to download the correct version of an Adobe Flash player to view them) they can be the perfect creative answer to a broadly visual / image based website. If you're interested in commissioning Mavo to design you an animated website, we'd start with your brief, design flat templates (off-line) and then consider animated sequences by sketching out storyboards. Once you've approved those, and we've settled on a strong creative idea, we'd get to work designing and developing your website. 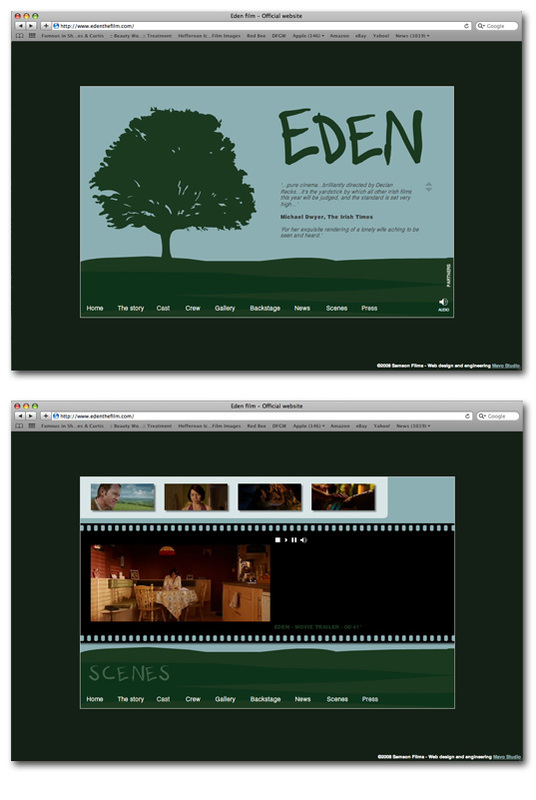 We were commissioned by Samson films to create both print and digital media to help launch their feature film Eden. The website had to house extensive "behind the scenes" footage and photos of the production (and of course work in harmony with the print media campaign). So, we decided to design and develop the website using Flash, as it's such a powerful animation tool and it handles 2-D graphics really well. Several "special features" were integrated, such as a photo image library and an easy to use video show case. But these features are best left discovered by you. Visit the Mavo portfolio for more information about this and other digital projects.